Considered as one of the well-received low-top sneaker for the past few months, the Jordan CMFT Viz Air 13 is expected to gain attention once again with the scheduled release of another colourway this August 2011. 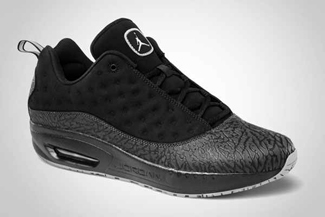 Released in several colourways for the past few months, the Jordan CMFT Viz Air 13 will come out in Black/Metallic Silver – Stealth – Anthracite colourway this time, which is simple, but is absolutely worth the money that you’ll spend for it. If you are looking for a low-top shoe for your lifestyle needs, consider choosing the new Jordan CMFT Viz Air 13 and you won’t regret it!